The purpose of this article is to show Colonel Nguyen Van Hieu's, II Corps Chief of Staff, command and control skills in Pleime Campaign. This campaign stretched from October 20 to November 26, 1965 and was II Corps' response to the Viet Cong's Plâyme Campaign. 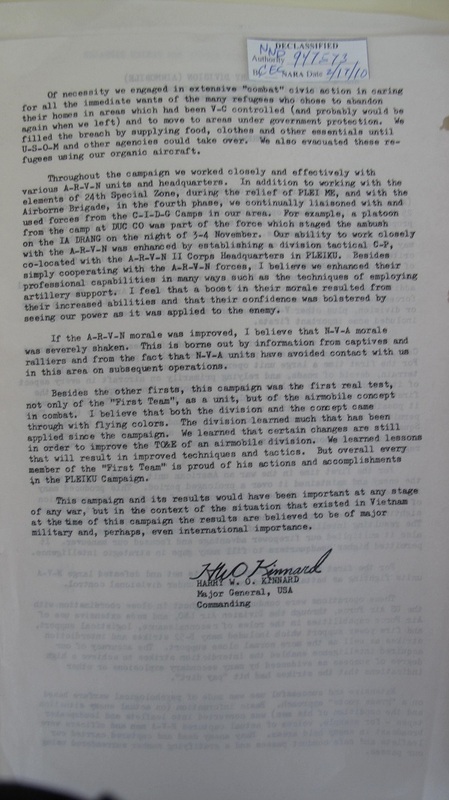 In this campaign, II Corps requested I Field Force for troop reinforcements with units from US 1st Air Cavalry Division. Firstly, it should be noted that during the entire campaign, II Corps Command held the control of all the operations - Vietnamese as well as American - (Dan Thang 21 of the Armored Relief Task Force from 10/20 to 10/26, All the Way of 1st Air Cavalry Brigade from 10/27 to 11/9, Silver Bayonet I of 3rd Air Cavalry Brigade from 11/10 to 11/18, Silver Bayonet II of 2nd Air Cavalry Brigade from 11/19 to 11/26 and Than Phong 7 of VN Airborne Brigade from 11/18 to 11/25). Indeed, when the Viet Cong opened fire to assault camp Pleime in the evening of October 19, 1965, II Corps Command stood up immediately to the enemy's challenge and assembled right away a relief column in the afternoon of October 20 and dispatched two companies of Vietnamese and American Special Forces Rangers to reinforce the camp in the morning of October 21. 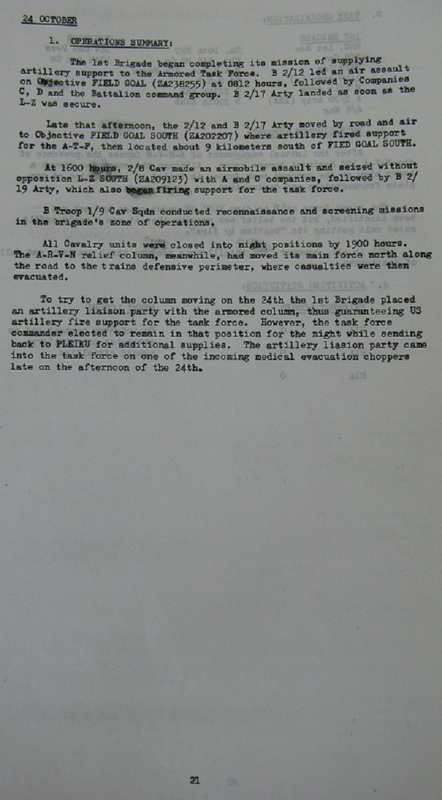 II Corps Command gave order to LTC Luat to use diversionary tactic to counter the enemy's mobile ambush tactic, by having the relief column lingering in the vicinity of Phu My for three days, until October 23 before resuming its advance toward the camp when it was known that the enemy units were on their way to the ambush site. 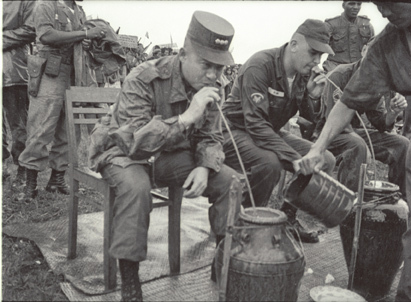 As soon as the camp was relieved, II Corps Command had a readied plan to pursue the enemy all the way to Chu Pong Massif, with 1st Air Cavalry Division as main force and VN Airborne Brigade as reserve force. 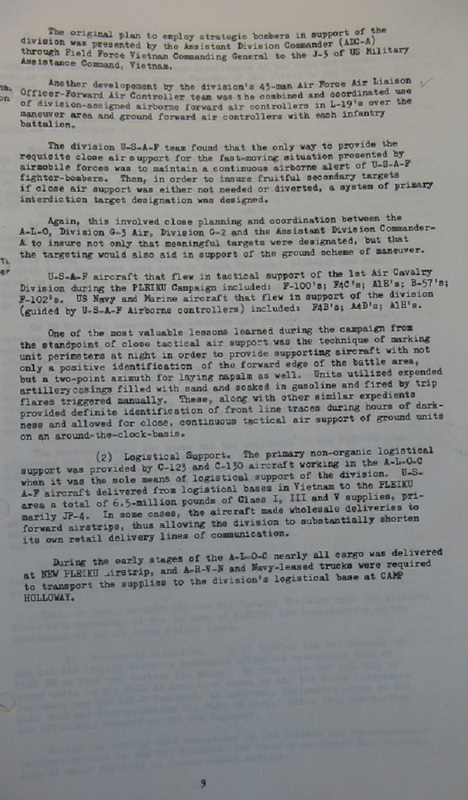 On November 9, II Corps Command suggested to 1st Air Cavalry Division Command a diversionary tactic consisting in having 3rd Air Cavalry Brigade replacing 1st Air Cavalry Brigade and switching the emphasis of the operations east bound with the intention of making the enemy thinking that the American side had lost their tracks. 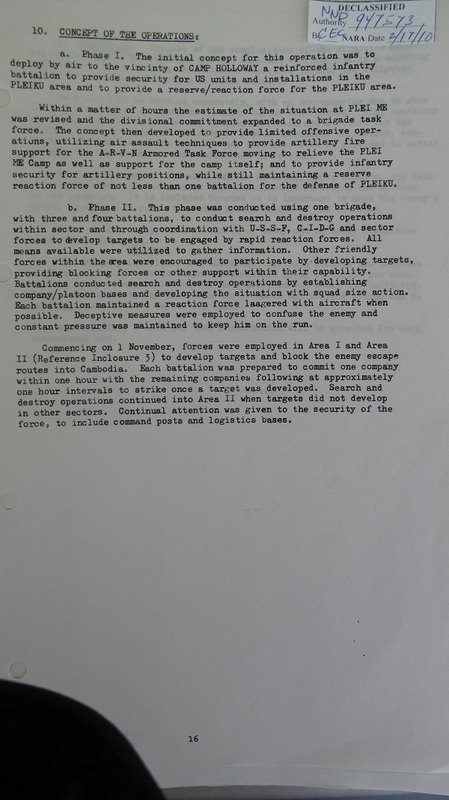 On November 14, II Corps Command had 3rd Air Cavalry Brigade launch its 1/7 Air Cavalry Battalion into Chu Pong Massif, at LZ X-ray into a blocking position, then coordinated with US Air Force to use B-52's carpet bombing the rears to destroy the two 32nd and 33rd Regiments for the two days of November 15 and 16, then had the American troops exit LZ X-Ray on November 17 in order to allow the B-52's to annihilate the 66th Regiment right at the landing zone. On November 17, II Corps Command took the decision to launch the VN Airborne Brigade into the battlefield as main force in pursuing the enemy with 2nd Air Cavalry Brigade as reserve force. The signal successes of the latter phases could, perhaps, never have been realized had it not been for the judgment and foresight of Vietnamese leadership. The initial preparatory effort on the ground, paving the way for the introduction of the 1st Air Cavalry Division, was accomplished by Vietnamese forces. Similarly the very successful final phase exploitation was accomplished largely by the Vietnamese Airborne Brigade. But then, who was the master mind at II Corps Command? It was Colonel Hieu, II Corps Chief of Staff, who had gained the full endorsement of General Vinh Loc, II Corps Commander. General Vinh Loc gave Colonel Hieu free hand in the conduct of Pleime Campaign. - 08:20H: II Corps Capt Ushijima - Who if anyone at Pleiku can make a Cmd decision if necessary in Vinh Loc's absence? Request you stay on top of Than Phong 6, Plei My and route 21 Opns and ensure timely and accurate info forwarded this HQ. Asn: Chief of Staff is here and has contact w/CG on coast. Question: Can CofS make a decision. Ans: He will have to check w/CG before making a decision. Colonel Hieu was tactful in his response: the Chief of Staff can make decision but not without consulting with the Commander. As a matter of fact, with or without his presence at II Corps Headquarters, General Vinh Loc was comfortable with Colonel Hieu's general staff and command skills. All planning was made by Colonel Hieu; General Vinh Loc was content with stamping and issuing the official orders. Nevertheless, Colonel Hieu was very discreet and tactful in his dealings so that General Vinh Loc appeared exercising his authority as a Commander in the eyes of onlookers. Consequently, when Pleime Campaign was over, General Vinh Loc was promoted to Major General and was hailed by the media as the Hero of Pleime. During Pleime Campaign, not only Colonel Hieu knew how to deal with General Vinh Loc, his immediate superior, but equally so with other Commanding Generals, Vietnamese and American, at I Field Force (Larsen, Smith), Joint General Staff (Vien), USMAC (Westmoreland, DePuy), 1st Air Cavalry Division (Kinnard, Knowles), Airborne Brigade (Dong), Group 5 US Special Forces (McKean), as this was a big campaign at corps level and higher, requiring the involvement of the highest military authorities and big units. It is quite normal for general officers who are given some authority to show they are competent and to assert their authority and to agree to implement ideas coming from other officers of same or lower ranking only if these ideas are obviously exceptional and under the condition that they do not negatively encroach on the aura of their authority. 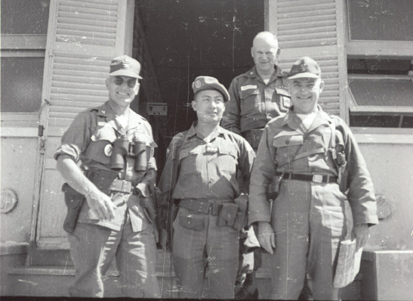 Evidently, prior to the occurrence of Pleime battle, the American Generals did not yet know Colonel Hieu's military skills - and for that reason might still projected a condescending or even cocky attitude - except perhaps Colonel Mataxis, II Corps Senior Advisor, who had witnessed Colonel Hieu in action in operations in early 1965 prior to Pleime battle: K'Nak (March 7-8, Hwy 19), Dan Tien 107 (June 29-July 1, Thuan Man), Than Phong 1 (July 16-25, Hwy 19), Dan Thang 7 (August 3-18, Duc Co) Than Phong 3 (August 19-September 2, Hwy 21), Quyet Thang 165-169 (September 23-October 2, Phu Cu, Bong Son, Phu Ly). It might have had happened that Colonel Mataxis, like Major Wagner, I Corps Senior Advisor in 1957, more than once pulled aside American Generals and whispered into their ear that this fellow is "very bright". Prior to 19 October, the available intelligence indicated strong enemy involvement to the east and north-east of the division's base area. Because of the threat to the rice harvest in the coastal regions from Tuy Hoa to Bong Son, the emphasis on planning for tactical operations was directed to that general area. On 18 October the enemy situation in Pleiku Province was as depicted in Enclosure 1. Despite recurring reports in II Corps Tactical Zone that the Pleime CIDG camp would be attacked (most of which were discounted) the enemy attack at 191900 October was mildly surprising. But, even with the building feeling of major enemy involvement, there still was general consensus that the coastal lowlands remained the real target area of Viet Cong efforts in the corps area. 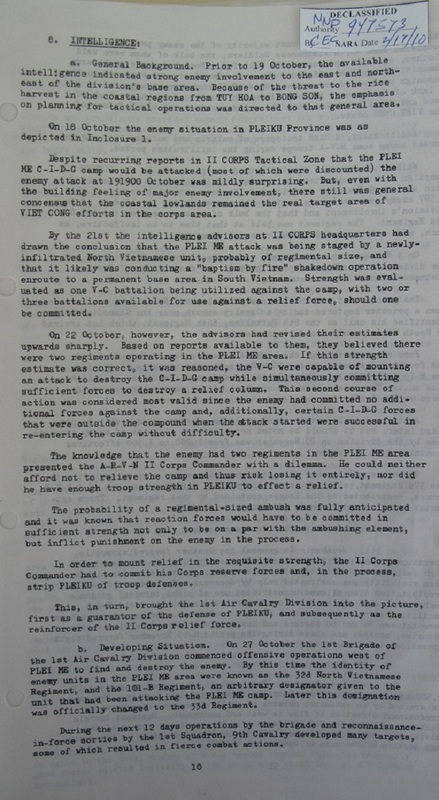 CG II Corps plans Than Phong 6 to go as scheduled, relief of Plei Me 2d priority. II Corps may request assistance from 1st Air Cav Div. Murray advised Broughton that CG, is not keen on committing the Cav in that area at this time, Broughton said only an alert for possible request and asked what this would do to Than Phong 6 opn. Murray reiterated previous statement about CG not keen. JGS made available to II Corps 18 VNAF H-34's due to arrive II Corps between 1600 - 1630. 18 VNAF H-34's were cancelled. From Col Barrow (Info fm Gen Larsen thru Gen Smith): TF Ingram is not to move from its present location to its planned destination (Ref: Than Phong 6). It will remain in place prepared to assist Condor. (II corps Advisory Gp). This includes its associated airlift (fixed wing and Chinooks). Pass to 1st Cav. Gen Larsen cancelled participation of TF Ingram in Than Phong 6 as of 202300H, includes airlift support will be prepared to assist relief of Plei My Camp on 21 Oct.
- 22:20H: II Corps Adv (Sgt Albreago) 41 Regt, CP 962784; Mar TFA CP 863754; 1st Mar Bn 874765; 4th Mar Bn 862756; Abn Bde CP 819886; 3 Abn Bn, 819886; 8 Abn Bn 819886; 5 Abn Bn, Bong Son; 6 Abn Bn, 819886; 7 Abn Bn, Bong Son; 4 Abn Bn, Phu My. Fm Lt Col Broughton G3 Adm for Col Barrow. II Corps would like the two Abn Rngr Co's and helilift moved ASAP to Camp Holloway Army Airfield Pku where they will stage for airmobile opn airlanded assault vic Plei Me. - 13:25H: II Corps (Capt Neary) - 2 Abn Ranger Co's are at Phu Cat. US Advisor is Capt Gretz. Strength of each Co is 110. Will be available for pick up at 1330 hrs. Co's are being alerted through US channels at this time. Request FFV contact 5th SF Gp and alert ARVN channels. - 18:25H: II Corps Capt Ushijima - Possibility of placing an Abn Ranger Co vic Plei My tonight. Col Bennett was told by SA II Corps, that the a/c would not be available until after 1900 and airlift impossible tonight. Col Bennett then requested 10 Americans be introduced into Camp to assist control of CIDG. Col Mataxis (SA II Corps) replied that due to tactical situation this could not be done. 18 VNAF H-34's were cancelled. It was apparently a false report. ZA 160050 is correct coord for Plei My. Abn Ranger Co discussed is one of the two Delta elems under SF control. They are in Pleiku. - 19:00H: MACV (Col Rainey) - Who are the 50 US which were mentioned in the request for air transportation. Ans: Project Delta. - 20:00H: Fm D/SA II Corps to Lt Col Patch. SA II Corps had just returned fm flight over Plei My Camp. Camp still holding out. Flare ships and fighters still supporting. A/1 Avn Co returned to Pleiku, because of weather. 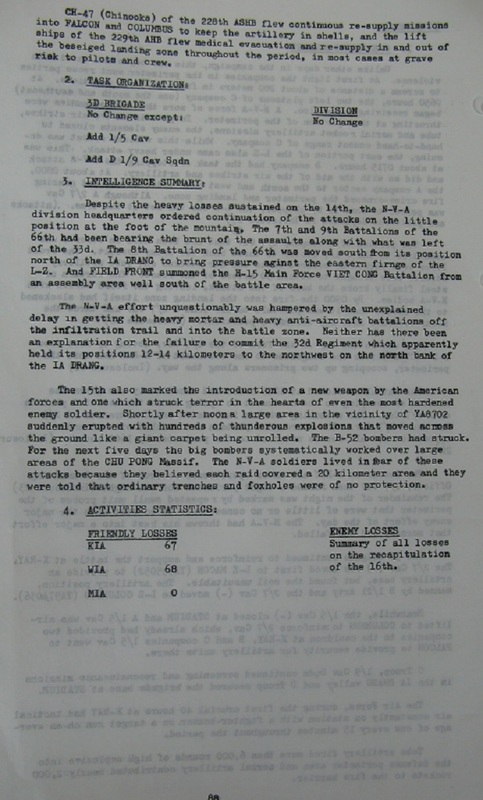 Request of Lt Col Bennett, 5th SFG, to move 10 US into camp denied. Colonel Hieu knew how to channel General Kinnard's aggressiveness to prevent him from overstepping on II Corps' control over the campaign in two instances. The initial concept for this operation was to deploy by air to the vicinity of Camp Holloway a reinforced infantry battalion to provide security for US units and installations in the Pleiku area and to provide a reserve/reaction force for the Pleiku area. Within a matter of hours the estimate of the situation at Pleime was revised and the divisional commitment expanded to a brigade task force. 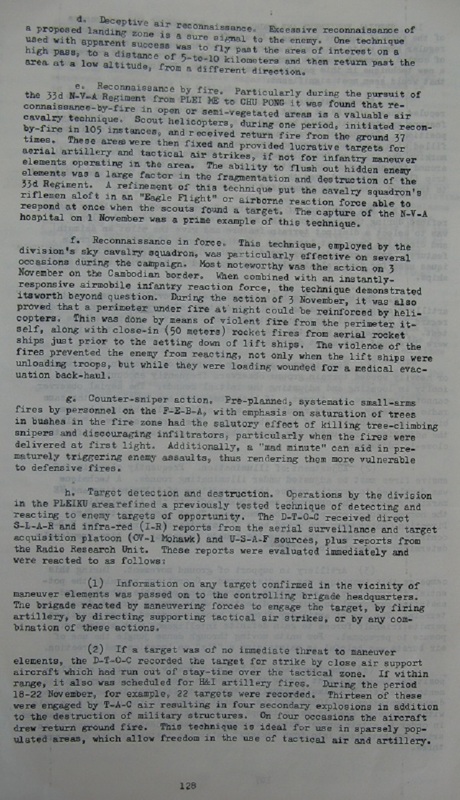 The concept then developed to provide limited offensive operations, utilizing air assault techniques to provide artillery fire support for the ARVN Armored Task force moving to relieve the Pleime Camp as well as support for the camp itself; and to provide infantry security for artillery positions, while still maintaining a reserve reaction force of not less than one battalion for the defense of Pleiku. - 23:50H: G3, Col Barrow - at approx 2300 CG rec'd call from Col Mataxis and Gen Knowles was with him. Based on info they passed to CG, CG approved commitment tomorrow of all or part of 1st Bde (PKU) at Gen Knowles's discretion. Gen Kinnard was with Gen Larsen. This info passed to Gen Knowles and Col Mataxis at approx 2315. Note: Col Barron was with G3/FFV; Col Mataxis, II Corps Senior Advisor; Gen Knowles, 1st Air Cavalry Division Deputy Commander; Gen Kinnard, 1st Air Cavalry Division Commander; Gen Larsen, I Field Vietnam Commander. To try to get the column moving on the 24th the 1st Brigade placed an artillery liaison party with the armored column, thus guaranteeing US artillery fire support for the task force. However, the task force commander elected to remain in that position for the night while sending back to Pleiku for additional supplies. The artillery liaison party came into the task force on one of the incoming medical evacuation choppers late on the afternoon of the 24th. After the initial meeting engagement on 23 October between the armored task force and the North Vietnamese 32d Regiment, there was more than a little reluctance on the part of the TF commander to get his column rolling toward Pleime. It was only after the guarantee of fire support from the 1st Air Cav artillery units and the actual placement of an artillery liaison party from the 1st Cav artillery in the column that the task force once again got moving to the CIDG camp. General Kinnard seemed not to be aware the fact that all actions taken by LTC Luat, from the departure at Pleiku to the arrival at camp Pleime, were dictated by Colonel Hieu, who gave specific order to LTC Luat to linger his relief column at Phu My awaiting for the enemy to show up first at the ambush site before proceeding forward. General Kinnard misinterpreted LTC Luat's pause as reluctance (Pleime, chapter IV). Early in the morning 23 October, as soon as report from the Camp reached II Corps Command, decision was immediately taken to push the relief column to Pleime without delay and at any costs. 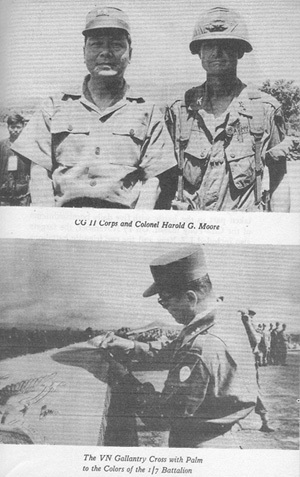 Colonel Hieu was not annoyed by General Kinnard's bullying attitude; on the contrary, he tactfully channel his energy and his eagerness for action to good use by recommending that he assumed the mission of pursuing the enemy to the very heart of their sanctuaries at Chu Pong Massif by means of his mighty fleet of 1st Air Cavalry Division's helicopters. In this phase, 1st Air Cavalry Division played the role of main effort with operation Long Reach and VN Airborne Brigade played the role of reserve force (Pleime, chapter V). Nevertheless, in order to prevent General Kinnard's tendency of stepping his foot on II Corps's control authority, Colonel Hieu took the precaution of devising a special procedure of coordinated operations between II Corps Command and 1st Air Cavalry Division Command as following (Pleime, chapter VIII). - Joint intelligence and support activities. - Commonly-shared concept of operations and results. - Separate deployment of forces. - Separate conduct of activities. The above procedure has brought many good results, especially in a country such as ours where the psychology of the people is charged with complexities and subtleties. I also find in that procedure a real competitive spirit between the two armed forces and between units. Our ability to work closely with the ARVN was enhanced by establishing a division tactical C-P, co-located with the ARVN II Corps Headquarters in Pleiku. By implementing this operational procedure, Colonel Hieu was able to control - in other words - to make General Kinnard act on his ideas because he demonstrated outstanding skills in the two key areas: joint intelligence activities and commonly-shared concept of operations. In the pursuing the enemy phase, the key issue was to accurately detect positions of enemy units in the midst of dense jungles that spread from camp Pleime to the Chu Pong footsteps. h. Target detection and destruction. Operations by the division in the Pleiku area refined a previously tested technique of detecting and reacting to enemy targets of opportunity. The DTOC received direct SLAR and infra-red (I-R) reports from the aerial surveillance and target acquisition platoon (OV-1 Mohawk) and USAF sources, plus reports and the Radio Research Unit. These intelligence technology means were quite sophisticated, and yet were not very efficient against the Viet Cong's camouflage expertise under the dense canopy of the jungles, in particular when the enemy laid low in immobility and maintained radio silence. Colonel Hieu's intelligence information relied mainly on "human source" gathering: interrogations of prisoners and ralliers, recon missions by Montagnard Eagle Flight teams and VN Airborne Rangers teams inserted inside enemy territories. It was this human intelligence Colonel Hieu provided to 1st Air Cavalry Division that allowed to know with precision the positions of each enemy unit, not only when it set up camp but also on the move. Intelligence officers, while now definitely identifying the unit involved in the ambush of the armored task force as the NVA 32d Regiment, still had no real positive identification of the unit in and around Pleime. There were several references by captives to the 101 Regiment, but there were dismissed because of non-agreement with current order of battle holdings. The 32d meantime, was well underway back to its regimental base at Pleithe (YA820070). By this time there were strong suspicions that a NVA divisional headquarters was controlling the enemy action. In fact, later determined that this headquarters was at this time moving from its battle location at Plei Bon Ga (ZA057155) to Plei Lao Tchin (YA807078) where it would be co-located with the 32d. Meanwhile, the first elements of the unit in contact at Pleime was beginning its movement westward to its advance base at Kro Village (enemy designation) at (ZA080030). By the 27th, the NVA regiment responsible for the siege of Pleime was positively identified as the 101B or the 33d, the latter designation used almost exclusively thereafter. By the end of the day, the lead elements of the 33d had closed on it forward assembly area, the village Kro, while its rear-guard battalion, was just beginning to break contact at the Pleime CIDG camp. But Kro was anything but a sanctuary as increasing numbers of helicopters flew overhead. For the 33d Regiment, the continued pressure from armed helicopters near its advance base at the village Kro (ZA080030) was becoming more and more uncomfortable. The fear of detection had begun to split the units and now many individuals had separated from their organizations and were straggling. The 32d Regiment had nearly closed its base on the north bank of the Ia Drang, although the exact route it took in its withdrawal from the ambush site still remains a mystery. The withdrawal of the 33d Regiment was rapidly becoming a nightmare. More and more armed helicopters began striking units of the regiment. So close were these attacks pressing to the advance base that by noon of the 29th the regimental cadre decided to keep the unit on the move to the west, seeking sanctuary. This time it was headed for its "home" prior to the attack on Pleime. This was Anta Village (NVA designation) at YA940010, located at the foot of the Chu Pong Massif. It was here during early October, that the 33d had conducted drills and rehearsals of its attack on the Pleime CIDG camp. Maintaining unit integrity was becoming increasingly difficult for many element of the 33d Regiment as Cavalry helicopters seemed to be everywhere, firing into carefully camouflaged positions and causing individual to either break and run or reveal positions by returning the aircraft fires. And a new element of danger had been introduced. Infantry units began air assaults in widely separated points throughout the general area through which the 33d must pass. At time these landings were far enough from regimental units so that battle could be avoided, but in other cases, the cavalrymen found retreating elements and sharp fire fights, always costly to the NVA would result. And with each such engagement, further fragmentation of NVA units would occur. As the small unit actions increased, the Cavalry obtained its first North Vietnamese captives and more and better intelligence concerning the enemy forces was becoming available to commanders. The constant harassment from the air and the sudden and unexpected landing of infantry troops at points throughout the area was causing consternation in the enemy ranks. Elements continued to disintegrate and fragment into small parties or, in some cases, individual stragglers. Many of these, left to fend for themselves, soon fell into the hands of Cavalry units. Contributing to the problems of the 33d was the acute shortage of food and medicines since many units could not reach their pre-stocked supply because of the sudden thrusts of the helicopter-borne troopers. The 33d Regiment sustained a major blow with the loss of its regimental aid station. Many of the patients were captured, along with many of the defenders and, more importantly, medical supplies already in critical short supply. By now the regimental headquarters had reached the base at Anta village, but the bulk of the regiment was still strung out between Pleime and Chu Pong. And these elements continued to draw aerial rocket and machine gun fire throughout the withdrawal. Also the heavy bombing and strafing attacks by USAF aircraft were directed against regimental positions with increasing accuracy as the secondary target detection system of the 1st Air Cavalry division began to click. The precision of the strikes was so upsetting that regimental cadre held a conference in an attempt to discover what was allowing the US forces to make such repeated, accurate air strikes. It was concluded that only spies within the ranks could be furnishing the location and movement of the regiment's elements. The capture of the aid station was a major find for the division and besides the opportunity it provided for destruction of NVA forces, it also yielded documents, including one particularly valuable map, that revealed enemy supply and march routes. These, in turn, were converted into intelligence that led to further interdictory bombings by the Air Force. The 33d Regiment now received orders to head deeper into the Chu Pong sanctuary. By 0400 on the 2d, the regimental CP had arrived at Hill 762 (YA885106). But while the head of the column had comparative safety, the body and tail, still stretching back to near Pleime, was anything but safe. Meanwhile, the NVA division headquarters (Field Front) had a bright spot in an otherwise gloomy picture. The last of its three regiments was due to arrive soon in South Vietnam and begin moving into assembly areas in the Chu Pong-Ia Drang area. The confidence of the newly-infiltrated 66th Regiment was badly shaken by the audacious ambush sprung by the Cavalry Squadron, in the very heart of the Chu Pong-Ia Drang complex. The 8th battalion had gotten itself bloodied before it had been in country for two days and, by losing a prisoner, tipped off its presence in South Vietnam. The 33d Regiment, meantime, was still trying to pull its bruised and battered tail into the Chu Pong sanctuary. But it became just another day of constant harassment from the air and ground marked by the loss of still more medical supplies and ammunition. After failing to overrun US positions on the south bank of the Ia Drang, the 8th Battalion, 66th Regiment, broke off the attack and pulled its dead and wounded back from the site of the engagement. The apparent discovery by Cavalry forces of a new NVA infiltration unit would cause the Field Front to re-evaluate its tactical position and begin looking for ways to counteract the continued pressure. An immediate action was to order the 33d Regiment out of its base at Hill 732, which it had hardly reached, and onto the eastern slopes of Chu Pong in the vicinity of YA922010 with its battalions (when they closed) to take up positions from Hill 732, down through Anta Village (940010) to the north bank of the Ia Meur (980000). The fragmented bits and pieces of the regiment were still making their way in a generally westward direction, clinging to stream beds, utilizing all available concealment to avoid detection by the ever-present Cavalry helicopters. There still was one unit reasonably intact - the battalion that had acted as rear guard. Starting later and moving more slowly than the rest, it was still east of main Cavalry positions. The day brought little change to the intelligence picture. The 66th Regiment continued to close into assembly areas in the Chu Pong sanctuary and the 33d Regiment waited for its shattered forces to rejoin the parent unit. The 32d Regiment and Field Front, meanwhile, remained untouched and untroubled north of the Ia Drang and adjacent to the Cambodian frontier. There was little change in the NVA situation as the 33d Regiment still awaited closure of its rear guard battalion into the regimental base. On the morning of the 6th the battalion was the only cohesive fighting force the enemy had east of the Ia Drang. By night-fall it had ceased to exist as an effective unit. In the Chu Pong sanctuary the depleted 33d Regiment licked its wounds and waited for its stragglers to come in. The remainder of Field Front forces were quiet. In the battle area there was diminishing activity. One NVA soldier surrendered with a safe-conduct pass. Only fragmented units and stragglers remained east of the Chu Pong-Ia Drang complex as the 33d Regiment began to assess its losses. Friendly intelligence at this point still was not really sure that the entire 33d Regiment withdrew to the west. One prisoner taken at Pleime stated positively that after the battle his unit was to walk for two nights south and east. In addition, there was strong suspicion that elements of the 32d Regiment may have slipped off to the east after the ambush. By this time Field Force Vietnam had asked the division to consider moving its operations east of Pleime if it appeared that was no further contact imminent in the west. * Does not include Regimental 75mm Company. Figures were not available or obtainable. In total, the headcount showed 890 men of the original 2,200 killed, with more than 100 missing and still more suffering from incapacitating wounds. Materiel losses were also heavy with the Regimental Anti-air-craft company losing 13 of its 18 guns and the Regimental mortar company losing 5 of its 9 tubes. Six more mortars were lost by the battalions, along with most of the recoilless rifles. The ammunition, food and medical supply losses also had been crippling. At Field Front headquarters north of the Ia Drang, it was a day of situation analysis. Encl 15 depicts the intelligence picture as it appeared to commanders on 9 Nov. There was little or no change in the situation as the transition between brigades continued. The movement and shift in emphasis from west to east was to further stimulate a forthcoming decision from the NVA division headquarters. Field Front headquarters, after evaluating the situation, had reached a decision. With American units seemingly withdrawing to the east of Pleime, the decision was to attempt to regain its early advantage with an attack. The target once again was the Pleime CIDG Camp. The division headquarters set the date for attack at 16 November, and issued orders to its three regiments. The 32d Regiment, of course, remained a cohesive fighting force, despite the casualties sustained during the ambush of the ARVN Armored Task Force on the road to Pleime. The 33d, as has been seen, suffered tremendous losses in its attack of and subsequent withdrawal from Pleime, but it still was to be committed again. With a view toward its future commitment, the 33d's cadre began reorganization of the depleted battalions into a composite fighting unit. The real cutting edge for the attack, however, was the newly infiltrated 66th Regiment, fresh from North Vietnam and spoiling for a fight. It would be in the van of the three regimental effort against Pleime. The disposition of the 66th on 11 November had its three battalions, the 7th, 8th and 9th, strung along the north bank of the Ia Drang (center of mass Vic 9104). The 33d Regiment still maintained its positions vicinity Anta Village (YA940010). The 32d Regiment was still north of the Ia Drang (YA820070). To add punch to the attack, Field Front also decided to commit a battalion of 120mm mortars and a battalion of 14,5mm twin-barrel anti-aircraft guns. These two units were enroute down the infiltration trail and were scheduled to arrive in time for the attack. The next five days were to be spent in preparation for and movement to the attack. Thus, for the first time, a full NVA division would be committed offensively against a target in South Vietnam. Field Front units continued preparations and rehearsals for the scheduled attack on Pleime. Field Front forces began staging in the Chu Pong-Ia Drang area in preparation for movement to Pleime and the projected 16 November attack. Some recon parties and transportation units already had moved out. - 11:00H: II Corps (Capt Campbell) POWS (in hands of II Corps: 1) Captured by 1st AC: MSGR Suon Hai. 2) Captured by SF: Cpl Nguyen Suon Lynn. 3) Captured by SF: Pvt Hoang Van Chung fm 32d Regt. 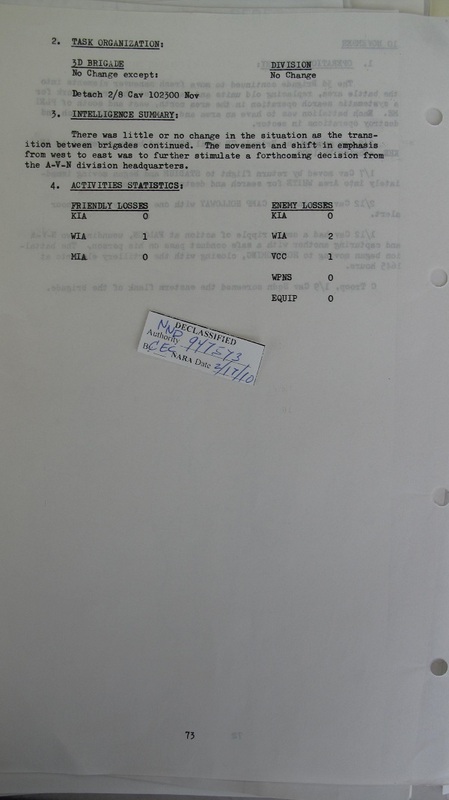 4) Captured by 1st AC: Name unk, died after arrival at IPW Center, was wounded. 5) II Corps has also two Montagnards suspected of being used by VC as guards. No significant intl value. Intelligence information generated from VC prisoners and ralliers contributed greatly in understanding clearly the enemy situation. Colonel Hieu emphasized this point in listing 24 such interrogations reports out of 32 sources in the reference section of "Why Pleime" (Pleime, Reference Documents). 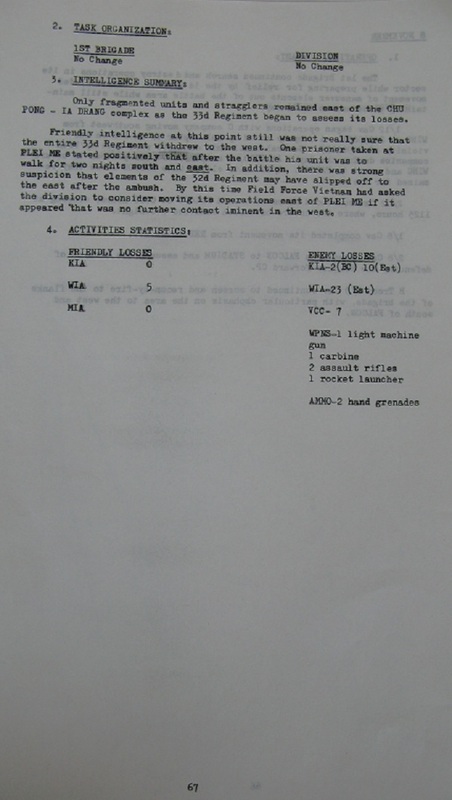 Two major intelligence pieces revealed by the prisoners were the planning of a second attack on camp Pleime set for November 16, 1965 and the tremendous casualties suffered by NVA 33rd Regiment. 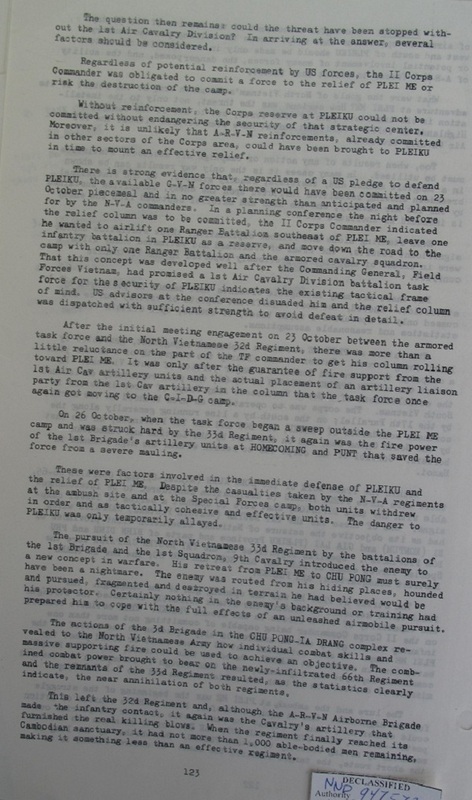 The 33rd Regiment's cadres, upset by the precision of friendly airstrikes held a conference in an attempt to discover what was allowing such repeated and accurate airstrikes to take place: it was concluded that only spies within the ranks could be furnishing friendly forces the location and movements of the regiment's elements. The maneuvering - insertion and extraction by helicopters and by recon in force operations - of Airborne Rangers recon teams was very delicate because their whereabouts amidst the enemy troops should be kept secret while precautions should be taken so they would not be hit when friendly units, in particular artillery, armor and air force, opened fires and bombed at the enemy troops (G3 Journal 3/FFV, October 29, 1965 at 10:35H and 11:00H): . - 10:35H: II Corps (Sgt Minney)(encoded) Request Delta Team locations and no fire zones for them. - 11:00H: II Corps (Capt Ushijima) Ref your encoded msg (Concerning loc of Delta Tms). II Corps has no knowledge of their locations. Of course, II Corps knew; it was just another way to say to keep out, it doesn't concern you guys. Although 1st Air Cavalry Division operated independently during the enemy search phase, Colonel Hieu did not hesitate to share his concepts of operations with General Kinnard. And General Kinnard fell for these concepts and implemented them because he should have found them so a propos. After succeeding in herding units of the three enemy regiments, 32nd, 33rd and 66th, into their rears in Chu Pong and after acquiring their respective positions (see the intelligence summary on November 11), seizing the opportunity when General Kinnard performed a unit rotation between the 1st and 3rd Air Cavalry Brigade, Colonel Hieu suggested to him to use a diversionary tactic consisting in switching the operational direction from west to east, which meant to leave the Chu Pong area and to revert back to camp Pleime, in order to induce the enemy into thinking that the American troops had lost their traces, in preparation for a surprise attack (Pleime, chapter 5). By this time Field Force Vietnam had asked the division to consider moving its operations east of Pleime if it appeared "that was no further contact imminent in the west". The movement and shift in emphasis from west to east was to further stimulate a forthcoming decision from the NVA division headquarters. - The enemy has lost nearly all their heavy crew-served weapons during the first phase. - They had been surprised by the attack of the 1/7 battalion and their commanders had failed to make the best use of the terrain. - Their tactics relied mostly on the "human waves" and they were too confident that their attack would disorganize the 1/7 battalion very quickly. The NVA effort unquestionably was hampered by the unexplained delay in getting the heavy mortar and heavy anti-aircraft battalions off the infiltration trail and into the battle zone. It is worth mentioning that since the afternoon on 15 November, the B52 stratofortresses had also taken part in the battle with five daily bombardments of the Chu Pong massif. On 17 November, the targets also included LZ X-ray and the two friendly battalions were so ordered to move 3 km away from the LZ, northward and northwestward to another called LZ Albany. The 15th also marked the introduction of a new weapon by the American forces and one which struck terror in the hearts of even the most hardened enemy soldier. Shortly after noon a large area in the vicinity of YAA8702 suddenly erupted with hundreds of thunderous explosions that moved across the ground like a giant carpet being unrolled. The B-52 bombers had struck. For the next five days the big bombers systematically worked over large areas of the Chu Pong Massif. The NVA solders lived in fear of these attacks because they believed each raid covered a 20 kilometer area and they were told that ordinary trenches and foxholes were of no protection. The original plan to supply strategic bombers in support of the division was presented by the Assistant Division Commander (ADC-A) through Field Force Vietnam Commanding General to the J-3 of US Military Assistance Command, Vietnam. Finally, after 1st Air Cavalry Division succeeded in destroying 2/3 of enemy troops from November 14 to 17, Colonel Hieu decided to bring in the ARVN Airborne Brigade to act as main force in the pursuit effort starting on November 18, while 2nd Air Cavalry Brigade played the role of reserve force in support of ARVN Airborne Brigade. 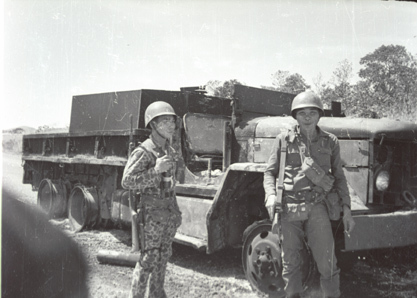 When directing the last phase of Pleime Campaign, Colonel Hieu controlled meticulously the operation named Than Phong 7, from gathering and transporting the five dispersed battalions of the Airborne Brigade in Saigon, Bien Hoa, Vung Tau and Phu Yen to Pleiku, from making arrangements for the setting up a new artillery fire base at Crooks specifically to support this operation, from inserting Airborne Ranger recon teams in support of the Airborne Brigade, from pointing out withdrawal avenues II Corps had predicted the enemy troops would use (Pleime, chapter VI), and finally from directing tactical moves on the battlefield ( G3 Journal 3/FFV, on November 19,1965 at 16:55H). - 16:55H: 1st Cav (Rear) Capt Parham - Fwd CP states the elem's in Abn TF area was coordinated at higher levels than Fwd G3. The Abn TF knows about it. - The ability to vanquish a much stronger ambush force of 2,000 troops with a much weaker relief task force of 1,000 troops. Prior to launching the assault on camp Pleime, the Viet Cong had tied down two reserve forces for II Corps - the Airborne Task Force A and the Marine Task Force Alpha - at Hoai An battlefront in Bong Son, along with the American helicopter squadron used for troop transportation. - The ability to read the mind of the enemy and to anticipate rapidly its tactics: one main effort (Pleiku), two secondary efforts (Hoai An, Pleime), faking an assault on a remote outpost and destroying the relief column, mobile ambush. - The ability to utilize a variety of tactics: envelopment, counter-ambushes, relief, pursuit, ambushes, exploitation, attack and destroy. - The ability to be good in defensive as well as offensive postures. - The ability to preserve his troops' lives in launching an assault when the enemy is at his weakest posture. - The ability to utilize the terrain to his advantage and to visualize the terrain and guess right moves that the enemy is about to take. - The ability of a strategist with a wide vision combined with the ability of a tactician with a meticulous mind. In other words, the ability to plan as well as to execute an operation. - The ability of responding rapidly to all sudden situation changes on the battleground. - The ability to utilize appropriately all means and logistic sources at his disposal. - The ability of conducting small and simple as well as big and complicated operations. - The ability to coordinate a variety of units: cidg Montagnards, special forces, airborne rangers, infantry, armor, rangers, paratroopers, marine corps, artillery, air force, armed helicopters, fixed-wing fighter airplanes, jet airplanes, B-52 bombers. - The ability to use soldiers of all levels of combat efficiency from low - cidg, infantry - to high - paratroopers, marine corps, rangers, special forces, airborne rangers - depending on the specific requirements of the battlefield. We also learned that in the previous battle of Duc Co, the VC always tried to take advantage of darkness to assault armored units. This time at Pleime, they had used the same tactics, offered to armored units one more opportunity to achieve exploits, and enhanced the pride of the 3rd Armored Squadron (stationed in Pleiku), the oldest armored unit in the ARVN which had taken part in the fierce fighting in Ninh Binh, Nam Dinh, Vinh Yen in North Viet Nam, before the cease-fire in 1954. The terrain at Pleime is covered by dense vegetations but the soil is hard, small streams rare and armored cavalrymen could feel comfortably "at home". In most cases, infantry protection is required to ensure the security of armored columns. The battle of Pleime on the contrary was a typical case in which the infantry elements considerably restricted the mobility and capabilities of the armored turrets. For this reason, Armor company commanders should not in the future cling to two-principles and had better expose themselves daringly instead of limiting their mobility with close infantry protection. This would provide not only liberty of action but also the arguments to defend oneself in case of being surprised. - The ability to promote a unique and highly successful coordinate operational concept between the Vietnamese and American armed forces while preserving national control and supremacy: shared joint intelligence, support and operational concepts and results, but separate TAOR, command, deployment of forces, conduct of activities and reserve. - The ability to exploit all intelligence sources - modern technology as well as traditional "human", prisoners, ralliers - to obtain a clear grasp of enemy units' situation and activities, headquarters as well as combat, from division, regiment down to battalion. - The ability to communicate operation concepts simply and clearly to all levels of commanders. - The ability to direct an operation while holding only an indirect control without a direct command. - The ability to convince higher levels of commandment to act on his ideas, Vietnamese as well as American, while Colonel Hieu was at the bottom of the hierarchical totem under 1, 2 and 3 star generals: Vinh Loc, Du Quoc Dong, Kinnard, Knowles, Larsen, Smith and DePuy. His forceful and compelling authoritative aura emanated from his inherent competence and not from his ranking or position.